Individuals with high net worth often present unique and complex issues in their family law matter. There are often substantial business assets, extensive personal expenses, and multiple homes that must be dealt with. The affordability of support is not generally the question, but rather how much support is enough? It is critical to have a detailed understanding of the financial lifestyle of the marriage, the assets and the liabilities. Only with a complete picture and awareness of each asset and liability can an attorney effectively act to limit negative consequences to asset division and establishment of support. Additionally, most couples often forget that the IRS and the state can be financial partners in a divorce. And, most importantly, once you have created such assets, the last thing you want to do is use your money and spend it on attorneys. We get that. Attorneys are, however, necessary to help you do it right. We want to help you get what you are lawfully entitled to, but we don’t want to waste your money fighting. Our goal is resolution and finding a way to make it a win win for both sides, whenever possible. We are prepared, detailed, responsive, and polite. We can help settle and mediate and lessen the litigation fees whenever possible. As seasoned trial attorneys, we know the high cost of fighting, and we try to avoid it whenever possible. Call us today for a one hour consultation, 480-219-2433. You will be glad you did. 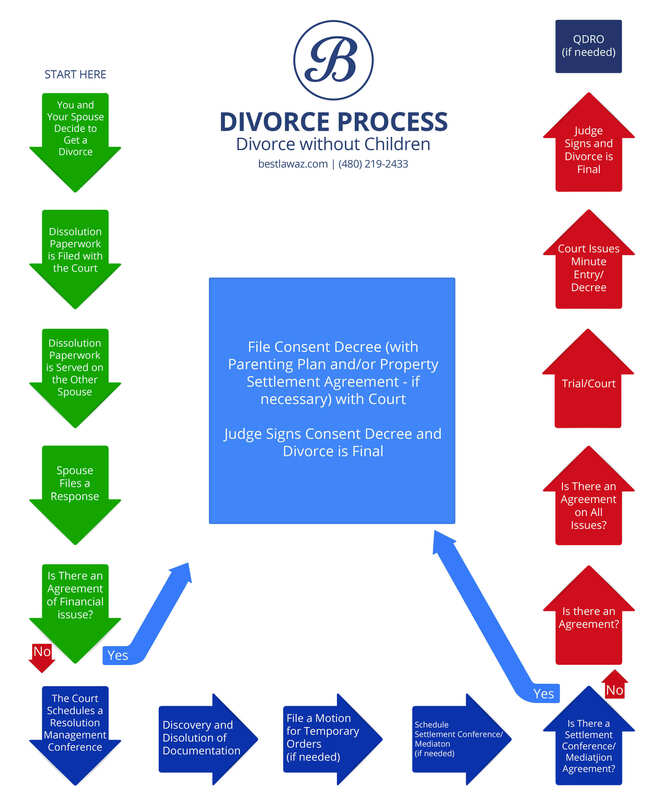 Click here to view the divorce process infographic. Every Maricopa County divorce requires standard documentation to begin the legal process. A Petition for Dissolution must be filed with the court and whomever filed the Petition must legally serve the opposing party. The forms can be found on the Maricopa County Superior Court Website, in our Divorce Coach Book, a document preparation service that we provide or by retaining the Best Law Firm. Click here to view the divorce process infographic. Filing Fees: Response to Petition for Dissolution $269.